Unlike the majority of Groundhog Day imitators out there, Russian Doll doesn’t live and die by its gimmick. Instead, the perpetual time loop that drives the story isn’t a narrative device so much as a vessel for its insights into human connection and gentrification. 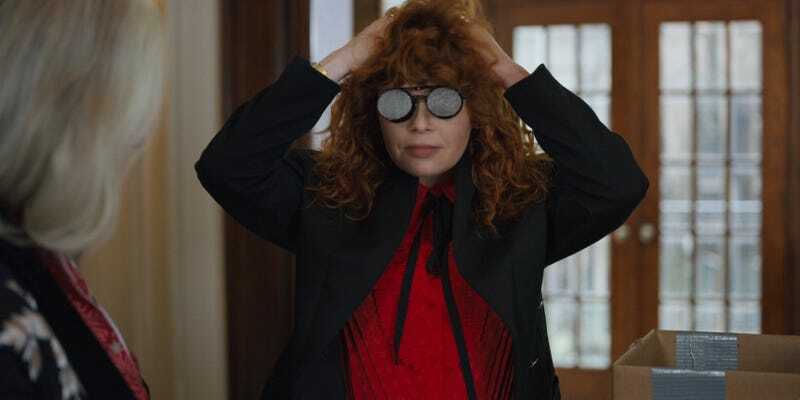 Still, it would be careless to not indulge in the subgenre’s comedic potential, and, though Natasha Lyonne’s numerous deaths aren’t comical so much as they are wildly surprising—the laughs they cull are born from a combination of surprise, dread, and mounting tension—they still satisfy in much the same fashion as those of Edge Of Tomorrow or Happy Death Day. There’s a morbid kind of fun, then, in revisiting them. And now, thanks to Vulture, you can do just that. From Nadia’s first skull-cracking taxi crash to those goddamned cellar doors to the doomed elevator ride that brings her and Alan together, the piece offers a slew of wince-inducing GIFs for your weird pleasure. Or maybe you’re just trying to sort through everything you probably binged in one furious sitting. She does 22 times, after all.